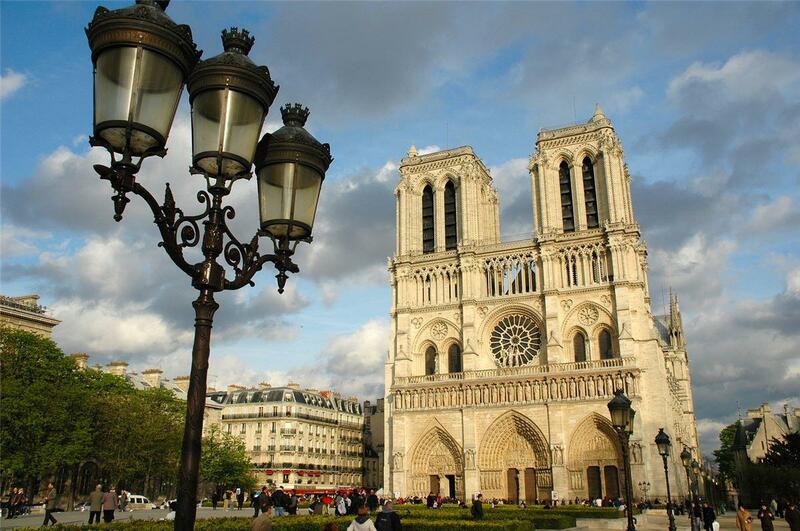 Notre-Dame Cathedral facts you must know ! 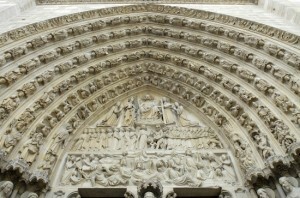 Designated a UNESCO World Heritage Site in 1991, Notre-Dame is the most visited monument of Europe. However, this outstanding gothic edifice didn’t appear out of the blue, and its story has been quite bumpy over the years. Here are some Notre Dame Cathedral facts you should know. Instead of the Notre-Dame’s forecourt we all know today stood another Cathedral until the 12th century: the Cathedral Saint-Etienne. It was a very big Christian Basilica composed of five naves. We still don’t know a lot about this Cathedral, but it was removed in the middle of the 12th century, under the reign of Louis VII. The bishop Maurice de Sully indeed decided to replace it by a new Cathedral, much longer and higher since the architectural progress finally enabled it. 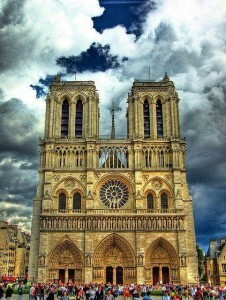 And so was born the gothic-styled Notre-Dame Cathedral with its huge two towers, as a tribute to the Virgin Mary. More precisely, the first stone of the Cathedral was set down in 1163, in the presence of the Pope of the time: Pope Alexandre III, and the edifice was complete around 1350. Its famous forecourt was created at that time as a separation between the non-believers and the believers’ world. As time went by, and because of the French Revolution, it unfortunately became damaged, losing for instance its arrow in the 18th century. The Cathedral is then in a sorry plight, and its gothic features are more and more considered obsolete. That is why, from the following century, some people tried to restore it, such as Viollet le Duc who was in charge of its renovation. Among other things, he rebuilt a new 96-meters-high arrow, and recreated the King’s gallery to make this Cathedral live again. However, his decisions were quite controversial, since he managed to add some personal details to the monument which didn’t exist originally, like the chimeras. Haussmann, as for him, made the forecourt (the Jean-Paul II square) much bigger, and this is now how we know this place. Top 5 : the Notre Dame Cathedral facts which make this edifice very special and will undoubtedly surprise you ! 5 : It holds a historical and religious unique treasure. 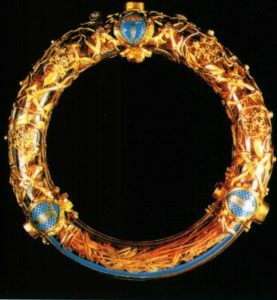 Although its 70 thorns has been spread around the world through time, the Holy Crown, which was worn by the Christ during the Passion, is now located in Notre-Dame Cathedral, along with a piece of the Cross and a Passion Nail. This very precious relic is honoured during the Thorn Holy Crown Worship Ceremony which happens every first Friday of the month, every Lent Friday and on the Good Friday. 4 : Its revival is mainly due to Napoleon and then Victor Hugo. As we mentioned before, Notre-Dame Cathedral has been through hard times in the 18th century, and it was even suggested to make it collapse. However, these two men helped saving it: Napoléon Bonaparte decided to make it the place of its 2-december-1804 Coronation, and planned big renovation works. 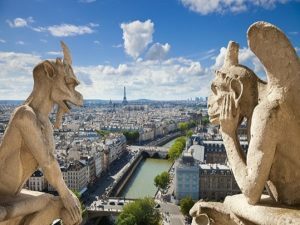 Later on, in 1831, the publication of Victor Hugo historical novel Notre-Dame de Paris and its success provoked a serious awareness of the value of this Cathedral in people’s mind, so that they gathered to save it. 3 : It is the departure of all the France roads. 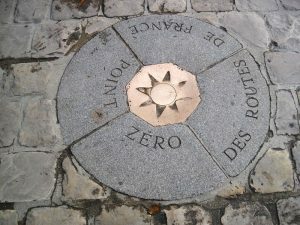 In front of the Cathedral, on Notre-Dame forecourt, you can find a round stone anchored in the paves, in which it is written “Zero Point of France roads”. It means that this point is used to calculate distances with the other French cities, so that maybe we could think that all roads don’t lead to Rome, but to the Notre-Dame Cathedral! 2 : It was a warehouse at a time. At the end of the 18th Century, it indeed housed many wine barrels of the troops of the Revolutionary Army, which shows how the situation was difficult and threatening for this Cathedral. 1 : Its roof is now full of bees. The aim is not to scare you, but to help preserving there species and to honour the benefits they provide to Earth. Don’t miss the opportunity to taste it, you’re palate will be thankful for its sweetness ! We hope you enjoyed these Notre Dame Cathedral facts, and if you want to discover other sights in Paris, we designed packages for you right here !